Are you tired of your dog barking to the point where you are not getting any sleep? Can't go on walks? If so you are not alone. Millions of dog owners have this problem, yet very few ever correct the behavior. When using commands just isn't enough, you may need something extra to trigger a response within your dog. That is why we developed the Pet Pawsabilities No Bark Collar. Now, you may be asking yourself, what's the difference between the Pet Pawsabilities Bark Collar, and any other bark collar on the market today? 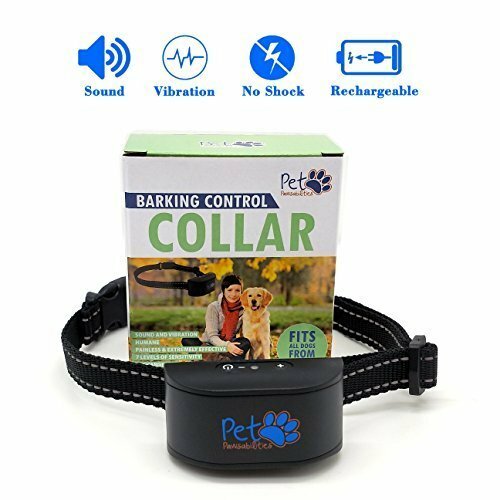 Our Bark Collar is the only humane collar that will NOT shock or harm your dog and will actually stop your dog from barking very effectively with just beep and vibration; at a fraction of the cost of other bark collars. You see, there's horrible horror stories that the rest of the pet brands selling shock bark collars don't want you to know..They try to tell you that their shock collars will stop your dog from barking safely...when in reality they cause burn holes, go off randomly and shock the dog for no apparent reason, which in turn confuses and harms your dog. Here at Pet Pawsabilities, we only provide you with products that are HUMANE, SAFE, ETHICAL and EFFECTIVE. Stopping your dog from barking too much no longer needs to be stressful and frustrating. Go with the brand that you can trust will always "tell it like it is" and provide you with products that flat out work and will not harm your pet in any manner. WORLD MISSION - For every item purchased, Pet Pawsabilities donates an item in need to local shelters and rescues. Pet Pawsabilities is also part of the National Canine Cancer Foundation and donates 5% of proceeds to the organization to help find a cure for canine cancer. We believe that pets are the most loving and loyal companions in our lives and we do everything in our power to make sure pets are well taken care of and have a good home. Be part of the change with Pet Pawsabilities. HUMANE AND EXTREMELY EFFECTIVE- Tired of those painful shock collars that not only don't work but cause pain to your dog? How about pointy probes that dig into your dogs skin? This bark collar is painless, extremely effective and contains SAFE ROUND FLAT PROBES. Our bark collar is designed to have your dog's barking under control in no time. Unlike many other bark collars, this bark collar is microprocessor controlled and has a voice recognition feature to minimize triggering of other sounds. TRAINING WITH SEVEN LEVELS OF CORRECTION- Making sure your dog stops barking ethically and humanely is our top priority. How the levels work: At the first bark and second bark, the dog bark collar will send out a warning tone. When your dog barks the 3rd time the bark collar will send out a warning tone plus vibration. Beep and vibration intensity will increase each time from 3-7. The bark control collar will automatically stop working for 1 minute after the 7th correction level and then reset. SEVEN BARK SENSITIVITY LEVELS - Easily customize the correct bark sound level for your dog with 7 different bark sensitivity levels. Simply push the "+" or "-" on the collar for adjustment. If your dog is a loud barker set the sensitivity at a lower level, if your dog barks softly or with a lower tone, set the sensitivity level higher. If you have any questions about this product by Pet Pawsabilities, contact us by completing and submitting the form below. If you are looking for a specif part number, please include it with your message.